A municipal employee (right) talks to a pedestrian next to a controversial street urinal installed on the Seine river banks of Île de la Cité, Paris, in August. The video may be tongue-in-cheek but its message about cleaning up Paris's streets is serious. Périssé begins the song crooning (in French): "I go outside, I breathe the breeze. That's when I am surprised, because today, Paris is making some noise. Yes, it's true. It doesn't smell like pee. I say thank you, again a big, sincere thank you to those who do not pee in Paris." France24 has a summary of the rest of the lyrics. Since its release last week, the video has gained hundreds of thousands of views. It's the city's latest salvo in its campaign aimed at getting men to, well, aim elsewhere. Earlier this year, Paris installed five uritrottoirs or sidewalk urinals — conspicuous red boxes with straw-lined tanks, topped by flower pots and a helpful illustration of a man relieving himself. The city says the boxes, placed in some of the city's most crowded corridors, serve a dual purpose. Number one, they contain the urine, with the straw filters "limiting unpleasant odors." Next, the straw is collected, composted and used as plant fertilizer. The city says, "A person emits each year through his urine enough valuable materials (nitrogen, phosphorus, potassium ...) to fertilize 400 (square meters) of wheat." And yet not everyone is saying oui oui to the campaign. Some video commenters bemoan the fact that tax dollars are going toward such low-brow ridiculousness. French newspaper La Libération reports the video cost the city about $7,500 to produce. In a statement the city told the newspaper, it was an "exceptionally low" price especially for "the visibility it offers about cleanliness and incivility "
Some say it is the uritroittoirs themselves that have gotta go because they are sexist by their very nature. As CityLab paraphrased the backlash: "Why should male Parisians get to go, while women have to hold it in?" The news site reports that by the end of August, the city was forced to remove two of the street urinals following coordinated vandalism that included covering the contraptions in cement, tampons and stickers. One sticker read: "Are you a dog? So why do you piss in the street?" As NPR's Merrit Kennedy has reported, the uritrottoirs are in the experimental phase. 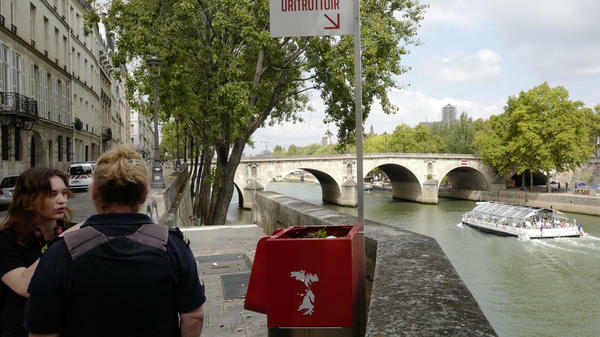 If Paris decides to eliminate them, it still has some 400 sanisettes — or free public restrooms — available to both genders stationed throughout the city.